Host the Green Buildings Are Better Display! 15 years ago, 15 committed volunteers came together to form one of the first six USGBC Chapters in the country – because they believed that green buildings are better. In honor of our 15 year anniversary, the interactive Green Buildings Are Better display is traveling throughout the region. Follow the link below sign up to host the display for a week at your office, house of worship, school, city hall, and more. 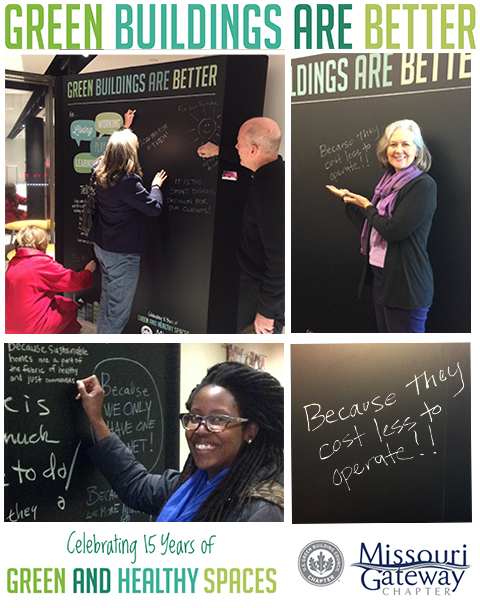 If you see the display out and about, be sure to add a comment about why green buildings are better and share photos with us on Instagram, Twitter, or Facebook using #greenbuildingsarebetter and #green15. Explore why Green Buildings Are Better for living, working, learning, and playing. We are thrilled to announce our lineup of educational programs and events for 2016 – our 15 year anniversary! 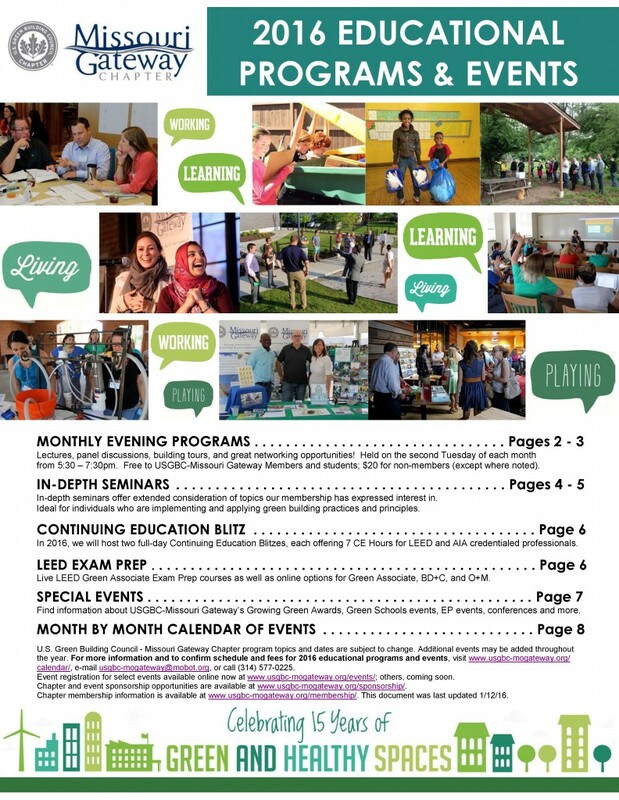 Click here for a complete listing of monthly evening programs, in-depth seminars, our Continuing Education Blitz, LEED Exam Prep, and more! Visit our events calendar to learn more & register for upcoming events. We look forward to seeing YOU at upcoming programs and events! Additional required information varies by building type. See the list below. Founded in 1998, the Donald Danforth Plant Science Center is a not-for-profit research institute with a mission to improve the human condition through plant science. The new 79,000 sq. ft. William H. Danforth Wing is currently seeking certification under LEED for New Construction, and will be the focus of our building tour. 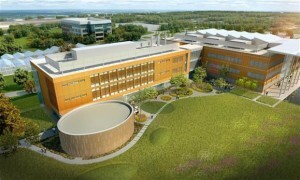 The expansion includes four levels, three of which contain flexible labs, gathering spaces, open office suites and computational facilities for up to 100 scientists. The surrounding landscape is currently undergoing reconstruction of a native Missouri tall grass prairie. Tour attendees will be guided through the new addition and learn about the building’s many sustainable design and construction features from members of the project team. Danforth Plant Science Center, 975 N. Warson Road (63132). Presented in partnership with Building Owners and Managers Association (BOMA) – St. Louis. Developed in partnership with leading physicians, scientists, and industry professionals, The WELL Building Standard® (WELL) is a performance-based system for measuring, certifying, and monitoring features of the built environment that impact the health and wellbeing of the people who live, work, and learn in these buildings. Jessica Cooper is a Provisional WELL Accredited Professional (AP). She has been involved with the development of WELL as it applies to live projects since its initial ideation phase and has assumed a management role in the implementation of the first WELL Pilot Projects since the public release of WELL in October 2014. She has led architects, developers, and engineers alike to understand the principles and research behind WELL and successfully build WELL Certified spaces. Her management and insights have influenced and informed the development and implementation of the WELL Building Standard over the past three years. Jessica graduated from Cornell University with a Bachelors of Science in Design and Environmental Analysis. She currently serves as a committee member on the Living Building Challenge NYC + NJ Collaborative, the IIDA New York Chapter Sustainability Forum, and Urban Green Council’s Membership Committee. A LEED Accredited Professional since 2008, Jessica maintains her Interior Design and Construction specialty and also holds a certificate in Green Professional Building Skills Training: Construction Management. Placing health and wellness at the heart of design and construction decisions can have a positive impact on human health, social equity, and return on investment. At this session, learn how to engineer spaces for improved community health and increased real estate value. Developed in partnership with leading physicians, scientists, and industry professionals, The WELL Building Standard® (WELL) is a performance-based system for measuring, certifying, and monitoring features of the built environment that impact the health and well-being of the people who live, work, and learn in these buildings. Join us to learn more about how the built environment can make a positive impact on communities through improving our health, happiness, and productivity. Thanks to our Evening Program Sponsor!